A new format by EZ Films, 'National Treasures', begins broadcasting this Sunday on RTEOne at 6.30pm. Filmed across the country, the television series is just one part of a unique multiplatform campaign that encompasses an online crowd sourcing platform (www.nationaltreasures.ie), a series of regional road shows and an exhibition in the National Museum of Ireland. The series explores fascinating objects in the hands of ordinary people that reveal the social history of Ireland over the last 100 years. 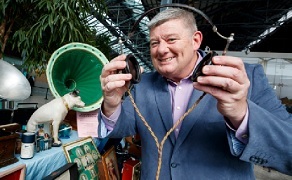 Presented by John Creedon and filmed at a series of unique road show events held across the four provinces, each episode uncovers and eclectic mix of objects that have been preserved in the attics, mantelpieces and shoeboxes of Irelands inhabitants. During each programme a carefully selected team of curators are tasked with examining these artefacts with the ultimate goal of selecting a special few to be included in a unique exhibition in the National Museum of Ireland. From politics to sport, work life to civil rights and music to fashion every single aspect of Irish social history will be explored encapsulating hundreds of fascinating objects. Alongside the exciting road show events the travelling curator Michael Fortune explores the boreens and laneways of rural Ireland meeting more objects and owners and searching out people who couldn’t make it along to the road shows. Across the series the show visits all four provinces beginning with Cork and travelling to Belfast and Dublin before coming to an end in Galway. The final episode will coincide with the launch of the National Treasures Exhibition in The National Museum of Ireland, Turlough Park, Co. Mayo. National Treasures is an original concept from EZ Films and is produced by David Clarke and Ciarán Deeney. It was directed by Ciarán Deeney and Maurice Linnane, edited by Paul Giles and is presented by John Creedon.